Our planet is made up of four layers: the crust, mantle, outer core and inner core. The crust is the top-most layer, followed by the thickest layer, the mantle. The innermost layer is the core, and it is composed of the outer and inner core. This article seeks to highlight the difference between the two innermost layers of the Earth. The inner core is the innermost layer of the Earth, and is believed to be a solid ball composed of iron and nickel along with some light elements (e.g., oxygen, sulfur, silicon). It has an estimated radius of 1220 km (768 mi). Seismologist Inge Lehmann was the first to discover the inner core as being solid and covered by a liquid outer core. Lehmann was able to arrive at this conclusion by studying seismic waves caused by earthquakes bouncing off the inner core’s boundary. It was suggested in 1940 that this inner core is solid iron. It is a widely-held belief that the inner core is gradually expanding as the liquid outer core cools down and solidifies where the two layers meet. This growth is believed to be important in generating the planet’s magnetic field. In addition, scientists also believe this phenomenon indicates a homogeneous characteristic of the inner core; that is, it remains solid if it is growing into the liquid outer core. It has been suggested the inner core could also be a big iron crystal. This theory was disproved when the inner core was discovered to be not completely uniform. Recently, researchers have discovered that the inner core also contains an inner inner core. It is believed to be between 250 to 400 kilometers in diameter. The outer core of the Earth is a liquid layer of iron and nickel 2,890 kilometers (1,400 miles) beneath the surface of the Earth. It stretches to about 2,300 kilometers (1,400 miles). It is estimated that the temperature of the outer core is from 4,000-8,000 K (6,740-13,940 degrees F or 3,730-7,730 degrees C) as it gets near the inner core, and 3,400-4,500 K (4,940-7,640 degrees F or 2,730-4,230 degrees C) in its outer regions. The constant churning of liquid iron of the outer core creates magnetic fields and electricity. This continuous process is called the geodynamo, and it is responsible for the magnetic field surrounding our planet. Without the Earth’s magnetic field, our atmosphere would be easily blown away by solar winds. Now that we have the facts, what’s the difference between the inner core and outer core of the Earth? The earth’s inner core is a solid ball of iron, nickel and other metals, while the outer core is liquid metal composed of iron and nickel as well. The temperature of the inner core is estimated to be about 5,400 degrees C or 9,800 degrees F, far beyond iron’s melting point. Intense pressure present within the inner core prevents the iron from melting. The hottest region of the outer core is about 3,730-7,730 degrees C or 6,740-13,940 degrees F.
In terms of size, the inner core’s radius is about 1,220 kilometers (768 miles). The outer core is believed to be about 2,300 kilometers (1,400 miles) thick, and is located 2,890 kilometers (1,400 miles) beneath the surface of the Earth. 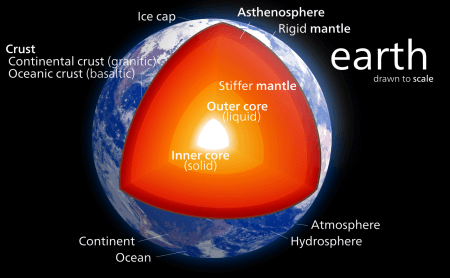 The inner core is about 6,371 kilometers (3,958 miles) deep beneath the surface.